Right Click Encrypter is a free file encryption software that can password protect your files from the Right-Click menu. Check it out here! Sophos Free Encryption is a free encryption software that allows you to secure files data with a password encryption. Download Sophos Free Encryption. 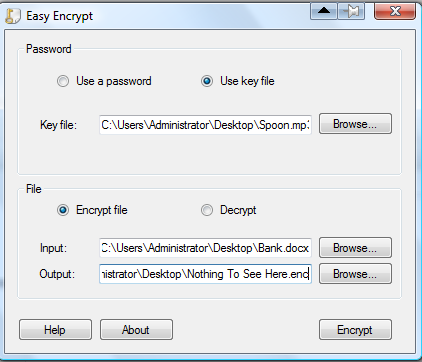 Easy Encrypt is a free software to encrypt and password protect your files. It uses Military grade encryption for that. Download Easy Encrypt free Here. Plain Sight – Hide Your File Inside Other File! Plain Sight is a free software to password protect files. It hides your files inside other files, so that no one can get your sensitive data. Download Plain Sight Free. Crimson128 is a free software that can encrypt files directly from the Right click context menu. It is extremely easy to use, and completely Free.